1. How often would you like to have this item shipped to you? 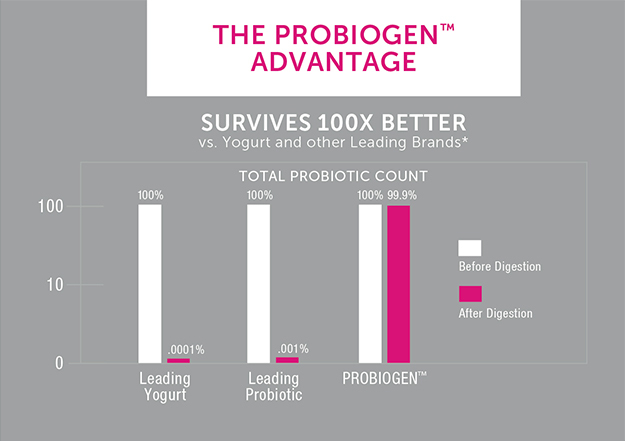 • Probiogen is the ONLY probiotic with breakthrough Smart Spore Technology™ - clinically proven to SURVIVE AND THRIVE in the gut 100X BETTER than leading brands and yogurts! • Don't be fooled by other probiotics’ CFU count, more is not always better. Our 1 Billion Thriving Spore CFUs is EQUIVALENT to 100+ Billion CFUS in Today's Leading Probiotics, and the difference is Probiogen's Probiotics arrive alive! • ONLY Probiogen provides Microbiologist-Formulated Probiotics that are DNA-Verified to guarantee the potency and safety of our products. The safety and effectiveness of our probiotics is our #1 Priority! • TRUSTED BY PROFESSIONALS: top doctors, physicians and nutritionists have tried and recommended Probiogen Probiotics to their patients and are seeing great results. provides natural adaptogenic herbs that help the body to manage stress, improve focus and promote relaxation. Probiotics boost nutrient absorption AND provide their digestive + immune system benefits. 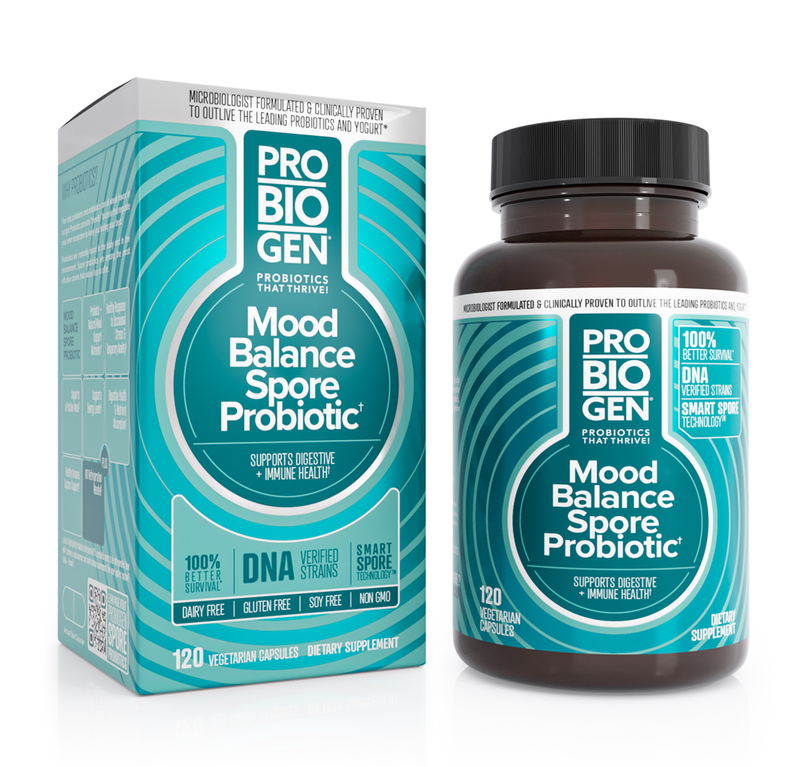 The STRESS & MOOD BALANCE PROBIOTIC is a microbiologist-formulated blend of natural ingredients that help the body manage stress, improve focus and promote relaxation with advanced spore probiotic strains. Probiotics provide the “friendly” bacteria that regulate your inner ecosystem to promote health from the inside out, with the added benefit of improved digestive balance and nutrient absorption of these important stress and mood balancing nutrients. • Ashwagandha is a staple in Ayurvedic practice, where it’s used to ease anxiety, stress and mood imbalances. Ashwagandha is an adaptogen, which means it helps the body effectively deal with stress. • Lemon Balm is widely used for its naturally calming properties. • Sage is known for its positive effects on cognitive functions and its natural relaxing qualities. • L-Theanine is an amino acid that’s used to promote mental and physical relaxation. • Holy Basil is a powerful antioxidant that’s been cultivated throughout history for its positive benefits on the mind and body. The Probiogen™ Advantage - Probiotics that Thrive! We’re revolutionizing the market with highly effective Smart Spore Technology™ probiotics that are proven to survive & thrive 100x Better than the Leading Brands and Yogurt. Unlike many other brands using poor-performing probiotic strains, Probiogen™ products are microbiologist-formulated using advanced Smart Spore Technology™ and DNA Verified strains. * Complete Study Available Upon Request. A true probiotic should provide live, viable cells that arrive alive in the gut and confer a health benefit. Leading brands with up to 200+ billion CFUs use strains that cannot survive the harsh gastric system, and only guarantee potency at the time of manufacture. You’re essentially getting dead bacteria moving through your system! Additionally, many of these popular strains already exist in huge numbers in the gut. Probiotic supplements should have a higher concentration than what already exists in your system to be effective. The use of spores as probiotics is an exciting development in the probiotic market. Spore-formers are nature’s true probiotics, and are naturally resistant to stomach acid. Our Smart Spores™ have a guaranteed 99.99%* survival rate and colonize in the gut for maximum efficacy. Probiogen™ provides guaranteed potency probiotics with clinically researched, DNA Verified Strains, including pharmaceutical grade Bacillus subtilis HU58™. DNA verification means you can always trust we’re delivering exactly what’s on our label – every time. Bacillus clausii: A well-studied, spore-forming probiotic with high efficacy and excellent tolerability. B. clausii can colonize in the intestine in the presence of antibiotics. Helps support healthy immune system responses. Bacillus subtilis HU58™: A spore-forming probiotic with the ability to support the decrease of bad bacteria. HU58™ also supports healthy immunity. Other Ingredients: Hydroxypropyl methylcellulose, cellulose plant fiber, vegetable magnesium stearate. Contains NO: GMO, dairy, wheat, gluten, salt, sugar, soy, artificial colors or flavors, binders, fillers or flow agents. Suggested Use: Take two (2) capsules twice daily after a meal or as directed by your physician. No refrigeration needed. Warning: If you are pregnant or lactating, consult a health care professional before using this product. Store in a cool, dry place. Do not use this product if the safety seal on the bottle is broken. Keep out of reach of children. Wow, do I feel better! I have been taking these for one month now. It is the only nutritional supplement I have taken except for vitamins. About one week ago I really started to notice a change in my mood. I have a fast paced job and drive an hour in heavy traffic each way for work. It's normal for me to feel stressed out and irritable many times over the course of a typical day. Suddenly that old feeling of frustration and anger is not front and center in my life. Now that it's gone, I'm surprised at how bad it was. I feel so much better. I bought this for my teenage daughter who suffers from autism, gastrointestinal issues and in recent years severe anxiety - it was my last effort at trying natural supplements whist I awaited paediatrician appointment to reluctantly discuss anti-anxiety medication. The difference it has made for her is incredible - screaming and obsessive thoughts dramatically decreased and calm enough to enjoy most outings and interaction again. She is incredibly sensitive to things so this is the only supplement I have her on, and it has taken a month to gradually increase to 3 capsules per day. I have been on these for well over a year and previously suffered from bad panic attacks and anxiety. They have helped greatly for me, with both. The time I notice it the most is when I run out and have to order more. I am noticeably worse again when not taking them. Great product. PROBIOGEN IS VERY EFFECTIVE PRODUCT.MY WHOLE FAMILY IS USING IT.